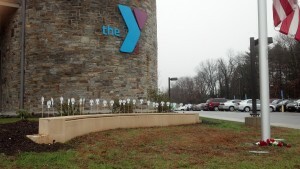 During a conversation recently with a member in which we were reflecting a bit on the past year, she made a remark to the effect of “Well, just another year at the Y…..”; her comment gave me pause. While it’s true that I’ve been a part of the YMCA for seven years, there’s no way I could ever classify any of them as ‘just’. 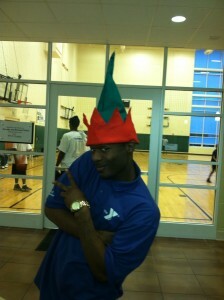 ‘Just’ is defined as ‘only or merely’, and there was nothing ‘mere’ about 2012 with my life at the Wheeler YMCA. – I was more deeply involved in our Strong Kids Campaign than every before. Typically my job function is to work on the guts of the Campaign; you know, assigning prospects, data entry, mailing reminders. Normal, mundane administrative work. This year, due to our ‘Tell Me Why’ theme of gathering stories from employees, donors, and Campaigners, I was fortunate enough to be in the thick of the emotions behind the work we do. I heard stories from Campaigners who feel so passionately about the YMCA and it’s mission that they volunteered extensive time to help us. I engaged in conversations with employees who generously gave donations because they were able to see first-hand the positive impactwe have on children. These true, geniune stories bolstered my resolve and gave me a sense of pride that has lasted all year. – I traveled to the Dominican Republic with the New England Alumni chapter of the Association of Y Retirees in order to build a home for a struggling family in the poverty-stricken village of Don Gregorio. This was an enormous thing for so many reasons…I had never been away from my husband and two school-aged daughters, I had never traveled outside the US, I did not speak one iota of Spanish, I absolutely detest heat and humidity, I had never once clapped eyes on any of my 14 other travel mates…the list goes on. The experience I had in exploring the beautiful country, befriending some of the Young Leaders at the YMCA in Santo Domingo, building lasting and meaningful relationships with the Dominicans in the village, and working physically harder than I ever had in my life is one that literally affects me every day. The example I can provide for my children and the empathy I was able to develop have made me a far better person than I ever was before. – I voluntarily played ‘Going on a Bear Hunt’ with one of our Small Smiles Nursery School classes. This may not seem like a big deal for most, but for me, this simple act marked a turning point. I’ve never been very confident around children, and the joke in the building is that I’m the last person anyone would ask to help out in any of our child care departments. They flock to me, though, for some reason, and I had gotten a request from one small girl…”Miss Erica, how come you never play with us? !” Really. What kind of a monster could resist that? I trucked over to the child care wing and happily sat in the circle. I ran through the woods, climbed up a tree, snuck into a cave…and stepped utterly and completely out of my comfort zone for the enjoyment of a passel of four-year-olds. Not ‘just another year’ at all. 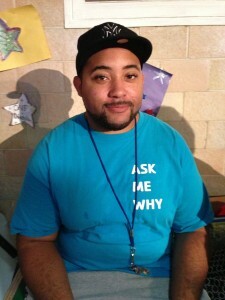 The Wilson Gray YMCA had their Annual Jingle All The Way Holiday Celebration and it was an evening of fun. 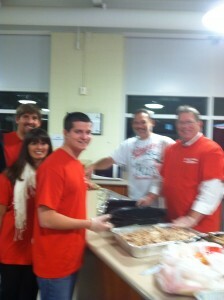 The event focused on members celebrating the numerous holidays during this festive time of year. They enjoyed various activities including cultural showcases, music, and performances from the Steel Pan Ensemble and Footlights. 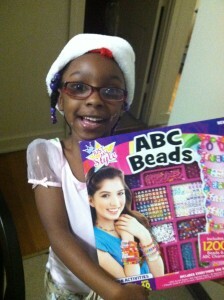 In addition, holiday gifts were donated for children ages 2 thru 14 years old. 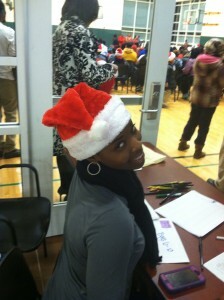 It was a great night for the community to connect and enjoy holiday spirit!! One of our mission statements is to be “good stewards of the resources committed to us” so to save money, our facilities department built one for us. Let me assure you, that the one you see in the picture, is far more beautiful and sturdy than anything we could locate on-line. 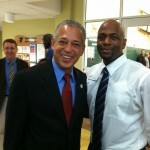 Thank you Jesse…You’ve made a big difference for Sean, for Livestrong, for our Older Active Adults and for our budget! Way to Live Our Cause! I had an experience this week that I want to share… I was working with multiple groups of children at a magnet school in Blo omfield. There was one little girl that wasn’t participating in any of the activities. I asked her why and she replied with “I don’t know how to dribble. ” I took a few minutes to demonstrate and give her step by step how to dribble the ball and when she finally got it she had the biggest smile across her face and wouldn’t stop bouncing the ball up and down the room. It made me feel good that I was able to teach her something new. 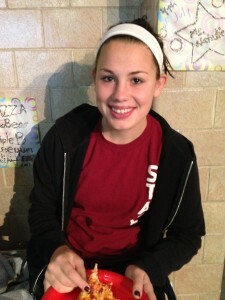 She now began to enjoy the basketball activities with the rest of her friends. 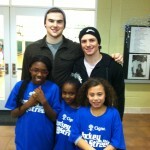 The Wilson Gray YMCA hosted the second annual Hockey in the Streets program this past week. 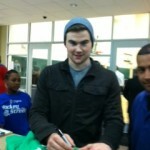 The program is a series of one hour hockey clinics for local kids from ages6 to 12. Connecticut Whale players and coaches stopped by and taught the kids a number of hockey tips to help elevate their skills. They offered three goals for everyone to follow. Live Healthy. Eat right, stay, active, and avoid dangerous activity. Be Me. Study hard, respect yourself, and do everything you can to achieve your personal best. Help Others. Spread your healthy outlook to your family, friends and your community. I think that’s a hat trick we can all aim for!!! YMCA Staff members are impacted by members every day! Recently staff Massage Therapist, Pam Howe received a “touching” response to her work and learned the impact she had made on a member! 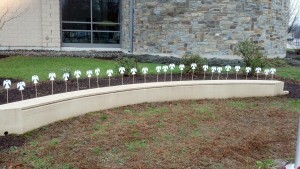 Great job, Pam- the power of your touch is felt by so many! Our branch was blessed to have Burt McNamar as a member. 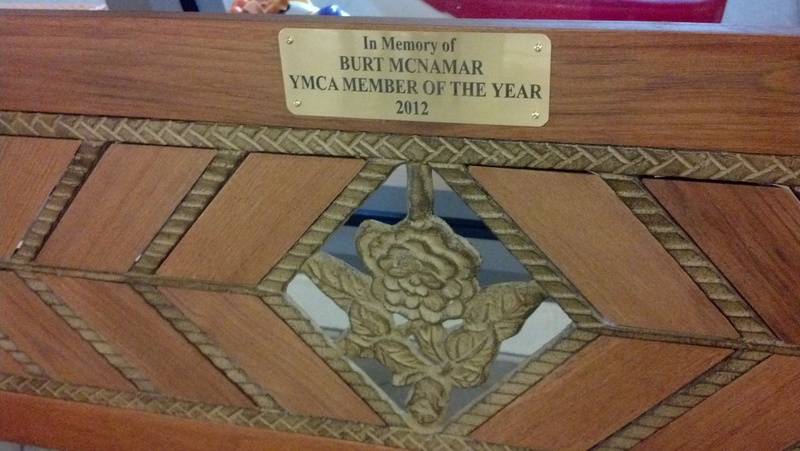 Burt made such an impact on us that he was selected as the 2012 member of the year. Burt passed away in November, and we still miss him. In Burt’s memory, we have a bench with a small plaque. This will serve as a reminder of his kindness, his love for the YMCA, and how we impacted each other. Burt’s widow Cindy stops by often to sit on the bench, and thank us for being a part of his life. In truth, the thanks belongs to Cindy and Burt for letting us be a part of their lives. We are all better people for knowing Burt. 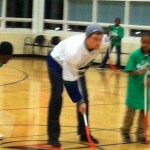 An experience that I want to share, is one that happened to me this week in my floor hockey class at the YMCA. During this class, we teach the children different techniques that they can use while playing the game. In order to help them with their aim, I created a game called “bowckey” (bowling hockey). We use this game during every class and it is actually a really popular drill now within the class. What made the experience even better is the fact that the other drills are paying off as well. The game was 3-2 last week, which shows that the children are learning. This is why I love being at the YMCA, so I can see the growth of the class within the few weeks that I have them. A Bear was made…and more!!! A Bear was made….and more! 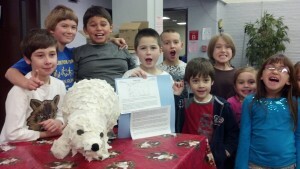 Willington After School Kids learn about Polar Bears!